Listing to eBay through a spreadsheet can streamline the listing process by allowing you to quickly copy and paste redundant information, or use formulas. This frees up your time to focus on populating the few fields that require unique information. The file attached to the bottom of this article contains three eBay listing examples. You can also use the file as a template to create your own listings. Before you list, you need a Warehouse (or Vendor Inventory List), an eBay Market List, an eBay Listing Rule, and an eBay Listing Template. You also need to add the products in Solid Commerce and save them in a Warehouse. For more information about these processes, see the Related Articles section. Enter your eBay Buy It Now price. If you are launching an auction with a Buy It Now option, enter the BIN price in this field. eBay may charge an additional fee for adding the Buy It Now to auction-style listings. See eBay's Help: http://pages.ebay.com/help/sell/fees.html. Populate this field with a number containing up to two decimal places and no currency symbol (no $). If you are launching auction-style listings, enter your start bid price into this field. Populate it with a number containing up to two decimal places and no currency symbol (no $). If you are creating a variation style listing, enter the SKU of your parent item for all of the items in the variation, including the parent. The file attached to the bottom of this article contains examples of two different variation listings. For more information on creating eBay variation listings, please see Setting up Solid Commerce to List Variations on eBay (Variation Groups and Listing Templates). If you are creating a variation style listing, you need to enter an eBay Variation Group name in this field. You can control the variation group on a listing-by-listing basis by entering the Variation Group name in your spreadsheet. Alternatively, if you use the same eBay Variation Group frequently, you can save its name in an eBay Listing Template. In that case, you don't need to include this column in your spreadsheet. In order to list to eBay, you need to specify an eBay category for your item. To provide categories on a listing-by-listing basis, enter a category ID number in your spreadsheet. For instructions on finding your ID numbers, see Finding eBay Category Numbers. If you don't list in too many categories, you can create a different eBay Listing Template for each category. In which case, you don't need to include this column in your spreadsheet. eBay charges additional fees to list in a second category. If you want to list in two categories, enter the category ID of the second category in this field. Enter the name of the eBay Listing Template you want to apply to your item. You can find your template names in Solid Commerce -> Marketplaces menu -> eBay Listing Templates. For more information, see Creating an eBay Listing Template. The name of the eBay Listing Rule you want to use on your listing. For more info, see Creating an eBay Listing Rule. list name The name of your eBay Market List in Solid Commerce. Enter lq in this field if you want to make your entire inventory available on eBay. You can also enter formulas to hide your actual inventory level from eBay. 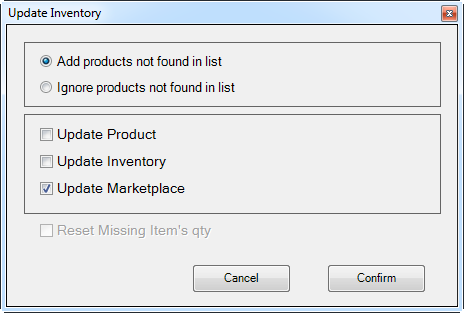 See Using the Listing Quantity Expression to Control the Quantities on Your Listings for more. Enter Yes to turn the automation on. To list new items, the automation needs to be turned on. You must also select them in your eBay Market List, and click the List products now button. Enter No to turn the automation off. If you turn the automation off on an existing item, we will not communicate with eBay about it anymore, not even if there is a price or quantity update. If you want to provide a unique title on your eBay listing, enter it in this field. If you want to use your Solid Commerce Product Name as your eBay title, enter the HTML tag <main:name /> in the Title field of your eBay Listing Template. If you choose to use your Product Name, you don't need to include the ebay title column in your spreadsheet. For more details, see Creating an eBay Listing Template. Enter your product description in this field. You can include HTML code. For more information, see Adding eBay Descriptions to Your Listings and Automatically Populating eBay Templates. If you don't want to create a description that is unique to eBay, you can use our description field instead of the ebay description field. The description can be used on multiple marketplaces. You only need to provide a description or an ebay description, not both. See the next row of this table for more information. This field allows you to enter a generic product description that can be used on multiple marketplaces. When submitting your listing to eBay, our system will first look for a description in our ebay description field. If the ebay description field is empty, we will submit the description from the description field. You only need to provide a description or an ebay description, not both. Keep in mind that adding HTML in this field will work for eBay, but may not work well on other marketplaces. You don't need to provide a UPC to list on eBay. However, if you use the Pre-Fill Optional or Pre-Fill Required setting in your eBay Listing Template to provide item specifics to eBay, we will search eBay's catalog for your UPC. If we find it, we can automatically populate item specifics and images from the catalog onto your listing. See Providing eBay Item Specifics Using Pre-Fill Settings or the Manufacturer Part Number (MPN) for more info. People also search eBay for UPCs. If you have entered a UPC in Solid Commerce, we will automatically submit it to eBay, which can help buyers find your listing. If you allow Best Offers on your eBay listing, you can enter a number with up to two decimal points and no currency symbol (no $) into this field. eBay will automatically reject any offer below this amount. You can use a formula to automatically calculate the minimum price based on the Buy It Now price in your file. For example, you can automatically reject any offers that are not at least 80% of your Buy It Now price. If you allow Best Offers on your eBay listing, you can enter a number with up to two decimal points and no currency symbol (no $) in this field. eBay will automatically accept any offer that is at least this amount. You can use a formula to automatically calculate the accept price based on the Buy It Now price in your file. For example, you can automatically accept any offers that are at least 90% of your Buy It Now price. You may list your items in up to two categories on your eBay Store. To specify your store categories on a listing-by-listing basis, enter one category number into each of these fields in your spreadsheet. You must enter the ID number eBay assigns each of the store categories you created. For instructions on finding your ID numbers, see Finding eBay Store Category Numbers. If you don't use too many store categories, you might be able to create a different eBay Listing Template for each store category. In which case, you don't need to include these columns in your spreadsheet. If you offer flat rate shipping, you can control the shipping fees on a listing-by-listing basis through your spreadsheet. You can also control the secondary item fee, which is the fee for shipping additional items if your buyer orders a quantity of more than one on your listing. For domestic orders, you can enter the surcharge for shipping to Alaska, Hawaii, PO Boxes, US Protectorates, or APO/FPO addresses. ebay ship fee 1, ebay ship fee 1 secondary, ebay shipping surcharge 1 - You can offer up to four domestic shipping options. To enter the fees for additional options, add columns to your spreadsheet using these same column headers, except advance the number from 1 to 2, 3,or 4.
ebay int ship fee 1, ebay int ship fee 1 secondary - You can offer up to five international shipping options. To enter the fees for additional options, add columns to your spreadsheet using these same column headers, except advance the number from 1 to 2, 3, 4, or 5. If you offer calculated shipping, you can specify additional handling fees on a listing-by-listing basis through your spreadsheet. eBay automatically adds the handling charge to the shipping fee. Buyers only see one shipping fee, not a shipping fee plus an additional handling charge. If you offer calculated shipping, you can enter the product weight on a listing-by-listing basis through your spreadsheet. Enter your weight in whole ounces (or grams if your eBay Listing Template is set to metric). Include the weight of shipping materials. If you do not enter a specific package weight for eBay, we will submit the general weight you saved in the Solid Commerce Product Weight field. If you offer calculated shipping in your eBay Listing Template, you need to provide package dimensions. If all of your items are standard sized, you can enter some representative dimensions in your eBay Listing Template. In that case, you don't need the package dimension fields in your spreadsheet. If you sell oversized items, you will want to provide accurate dimensions through your spreadsheet so that eBay can calculate the overage charges. Enter the dimensions in whole inches (or centimeters if your eBay Listing Template is set to metric). Don't include decimals. If you want to specify product condition on an item-by-item basis instead of through your eBay Listing Template, you can enter the Condition ID Number for your item into your spreadsheet. Conditions vary from one category to the next. If you aren't sure which of the conditions in the table below are available for your category, you can check the condition field in your eBay Listing Template or look in eBay's Seller Manager. For items that aren't in New condition, use this field to highlight any defects, missing parts, damage, or wear and tear to the item. Include this same information in your item description. You can enable this option in your eBay Listing Template, or you can enable it on an item-by-item basis in your spreadsheet. For more information, see Using eBay's Out of Stock Control Feature. If you are an eBay Motors seller, and you have many parts that fit the same vehicles, you can save sets of compatibilities in templates called Fitment Groups. By providing the name of the Fitment Group in this field, you can automatically add those compatibilities to your part. For more info about creating Fitment Groups through the user interface or Excel, please see the Related Articles section below. The UPC and eBay Description are Product Level fields. We included them with the rest of the product information on the Products & Inventory tab of our template. If you include the UPC and/or eBay Description columns on your eBay specific worksheet, you need to check the Product update option during upload. To use our Excel Add-In Tool to upload the eBay tab of the attached template, click the Upload Data button, and check only the Update Marketplace box. To upload the eBay tab through our web uploader instead, go to the Products menu -> Import Products and Inventory. Check the Import Marketplace box, and select eBay from the Select marketplace drop-down. If you are adding new items to Solid Commerce, to list them, you need to select them in your eBay Market List and click the List products now button. This file contains three examples of eBay listings: one standalone product, one size only variation, and one size and color variation. You can also use it as a template to create new listings.